Audiophile Audition (01.12.2011): Best of the Year Discs for 2011. This Carnaval will make you smile, admire, and wonder that something new to say about an old brew is still possible. As with Ammara's recording of Chopin's Ballads, her Schumann playing is really something special - somethng to make one sit up and take notice. No matter how many performances you already might have of these works, the special treasures you will find here are of unique value. The notes are perceptive, and the sound beyond reproach. Dare I ask for more Schumann? A wonderful performance of Davidsbündlertänze in big robust surround sound. It's a lovely performance, as is the whole of her rendition of Davidsbündlertänze. Very much recommended! Much impressed by Alessandra Ammara’s recording of Giacinto Scelsi’s Preludes, I was more than enthusiastic about hearing her tackle these ‘essence of Romanticism’ masterpieces. 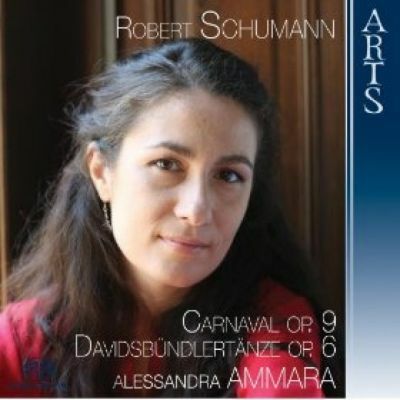 Given state of the art sound with an excellent piano recording, every nuance of Ammara’s performance is held up for close scrutiny, and to my ears she comes up trumps with just about every aspect of Carnaval. (...) Ammara’s touch makes the notes rounded and small, almost reluctant to leave the soundboard of the piano. (...) This is a performance which leaves no stone unturned, and which grips from beginning to end, and I am full of admiration for Ammara’s craft in achieving this. (...) To my mind this recording is something rather special. There are magical moments all over the place, and the richness of variety in colour, breathtaking sonorities and breadth of expression which Alessandra Ammara brings from a bunch of hammers and metal strings stretched over a plank of wood is something which remains eternally fascinating. (...) If I don’t choose this as one of my discs of the year, put it down to administrative error." "Eternally fascinating and really rather special.